After my bunny cupcake disaster, I still wanted to make something bunny shaped. When I saw this mold, I thought of a bunch of things I could make – cake pops, candy, marshmallows. I made homemade Peeps 2 years ago when I first started blogging but I haven’t made them since. This time, I used a recipe that didn’t require corn syrup and sets up immediately, so you don’t have to let them sit for several hours or overnight. I like a little instant gratification, don’t you? The homemade Peeps turned out great – imagine biting into a fluffy cloud of marshmallow, with a little crunch from the sprinkles. Store bought Peeps don’t even compare! Plus, I incorporated them into a special cupcake – see the Peepcakes here! What other candy should I try making from scratch? Mix cocoa powder and water together to make a paste. Use a toothpick and make the eyes and nose. Lightly coat a silicone mold or small pan with non-stick spray. In a small saucepan, combine 1/3 cup cold water and sugar. Whisk together over medium heat. Once sugar is dissolved, stop stirring and cook until mixture reaches softball stage (between 235-240°F). While sugar mixture is boiling, sprinkle gelatin over 1/4 C cold water in a large, deep heatproof bowl (a stand mixer bowl is perfect for this). Let stand for about 1 minute, until it softens. Once the syrup reaches softball stage, remove from heat. Turn mixer on low and carefully pour hot syrup into into gelatin, avoiding the beaters and sides of the bowl. Increase to medium-high speed and beat for 8-10 minutes, until mixture thickens, turns white and can hold soft peaks. Immediately and quickly spoon into prepared mold or pan (the mixture will set quickly so don’t wait long). Drop marshmallows onto a plate covered with colored sugar and move them around to coat each side. To make eyes and nose, sprinkle some cocoa powder on a clean plate. Dip a toothpick in water and then dip wet tip into cocoa. Dab dots onto sugar covered marshmallow. @justcooknyc – thanks! I love how they turned out. Totally adorable. Can’t wait to see the cupcakes! @Stef – thanks! I’m excited to see your Krispy Kreme doughnut cupcakes! @Melissa – thanks! 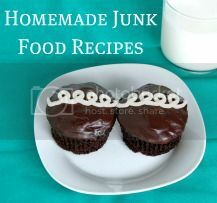 I’ve made a lot of “homemade junk food” (Hostess cupcakes, chocolate syrup, Goldfish crackers, etc.) – I love finding ways to make things people assume you have to buy from scratch! Plus, you can avoid a lot of preservatives and other icky ingredients that way. @Sues – thanks! They were a bit sticky, but that was remedied as soon as I coated them in sprinkles. these are so cute! definitely want to try these for easter this year! These are so cute. I bought that same heart-shaped donut pan after Valentine’s day. I already forgot I had it. Have you used yours yet? Adorable! Makes me want to go find some molds. I live in France and we can only get gelatin in sheets- can you tell me the conversion (how many sheets per tsp)? Thanks! @Cheryl in France – I’ve never used sheets, but I found this thread on Chowhound: http://chowhound.chow.com/topics/591209#4362246 Someone there says 3 1/2 sheets equals a packet of gelatin. Let me know if that works! I am SO making this and SO sharing it with your readers! I just saw a picture of these on Pinterst – so cute and adorable! I also like that you have a recipe that doesn’t use corn syrup. I made some homemade peppermint marshmallows on New Year’s Eve – didn’t realize how long they had to set up…oops! my bad for NOT reading the recipe all the way through. 😉 They were mighty tasty though. Can’t wait to try this one. Oh my goodness – these were SO EASY!! I just made a batch in all of 20 minutes from start to finish. Now to go find a bunny pan!! The only “complaint” I have received from the peep eaters in the family is that they are “too creamy”…. lol… It just goes to show how accustomed to stale processed foods we are. I made these last year and poured in a 8×8 pan and (using lots of p. Sugar) cut out using small metal cookie cutters. Came out so yummy! How did you get your marshmallows to look so fluffy? I made then one time and they were super dense. Is the secret no corn syrup? check it out!! Happy Easter!! Just pinned these to my “Desserts to Make” board. What a great idea! Can I use regular sugar instead of colored sugar? @Kitty – sure, or powdered sugar if you don’t want the crunchy texture. Wow! Genius idea! I made my own “peeps” once, but I used a cookie cutter to cut out shapes from a sheet of marshmallow. Yours are totally cute! @Meg S. – thanks! I’ve made them using cookie cutters too. Both ways work but using a mold made perfect shapes. We stay away from artificial dyes, so I was looking for a homemade peep recipe to make with naturally colored sugar. These look amazing and simple! Thanks! Dana, I’m not sure if higher altitude would affect these or not. I very carefully spooned the marshmallow into each mold, so if you poured yours in that may be the difference. How far in advance can these be made? Simply store in air-tight container? Patti, I’m not sure exactly how long, but my guess is they will last 2-3 weeks. I’d make them up to 1 week in advance to be safe. Yes, store in an air-tight container at room temp. Can I use a flavored gelatin? Deanne, I haven’t tried it. My only concern would be the addition of more sugar from a flavored gelatin, but I think it would work. Let me know if you try it! I make my own to avoid the artificial dyes and flavors, so I was happy to discover that you can use freeze-dried fruit, like strawberries, bananas, etc. Just pulverize them into powder in your blender first, then add the powder after pouring the hot sugar solution into the gelatin and before turning to high. Mine came out kind of goopy and gummy not sure what I did wrong. my son has a serious food protein allergy condition (FPIES) so i LOVE that this has very few ingredients. we recently added beef so gelatin should be safe for him – he may actually get to have candy in his basket this year!!! I made these using coconut sugar and they turned out a pretty light chocolate color. Tasted yummy too! thanks for the great recipe. I made marshmallows with my son yesterday and they turned out great. Just wondering how long these marshmallows can be stored or kept? 1 week or longer. Thanks once again.